It has been an exciting spring at the Waste Treatment and Immobilization Plant Project. We removed one of the vessels used to conduct important tests for the Pretreatment Facility to make way for its replacement, which will be used in a final set of full-scale tests. And our engineers have begun using mobile tablets to create more efficiencies in their work at the construction site. We highlighted these points of progress in this issue of Vit Bits. I am proud of how our team is addressing the complexities and challenges of building the world’s largest vitrification facility. I encourage you to read about the progress we’re making. In June, the Department of Energy’s Office of Enterprise Assessments released a report with results from its quarterly review of construction quality at the Vit Plant. The report concluded that six of the eight areas reviewed were found to be satisfactory. The Office of Enterprise Assessment four-person review team identified no opportunities for improvement. Two areas noted for needing attention are being corrected and tracked to completion. 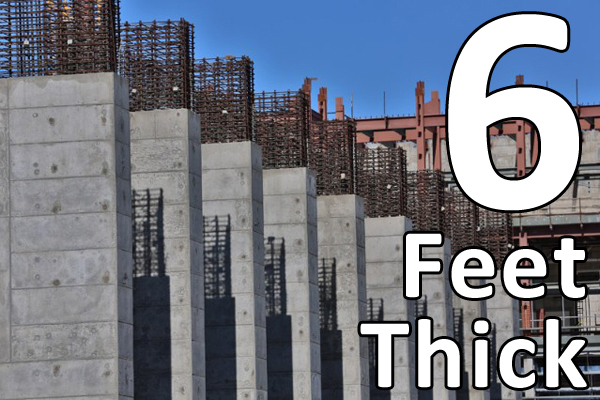 The eight areas reviewed included: corrective action programs, installation of post installed concrete anchors, piping pressure tests, concrete placement records, welding inspection program, electronic construction, construction field engineering training programs and qualifications, and self-assessment and quality assurance surveillance. This assessment is one of many that demonstrate the continued progress Bechtel is making to bring the first phase of the Vit Plant on line and begin making glass as soon as 2022. The 16-foot-diameter test vessel being fabricated in Vancouver, Washington, will be barged up the Columbia River to Richland later this summer. Hanford Vit Plant subcontractor Greenberry Industrial of Vancouver, Washington, was named Small Business Supplier of the Year by Bechtel at its annual Supply Chain Recognition Awards event. 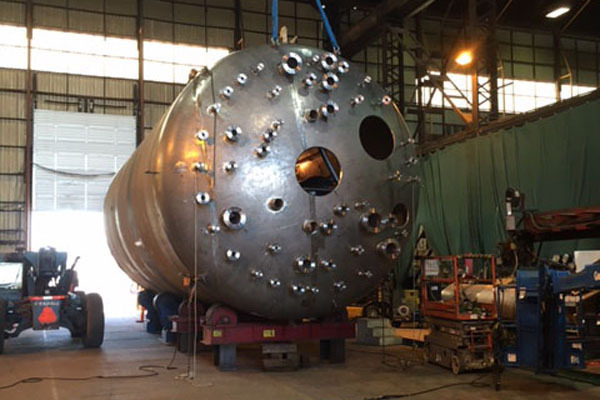 Greenberry is fabricating a 16-foot-diameter by 38-foot tall stainless steel test vessel at its Vancouver facility. Later this summer, it will be barged up the Columbia River to Richland, Washington. 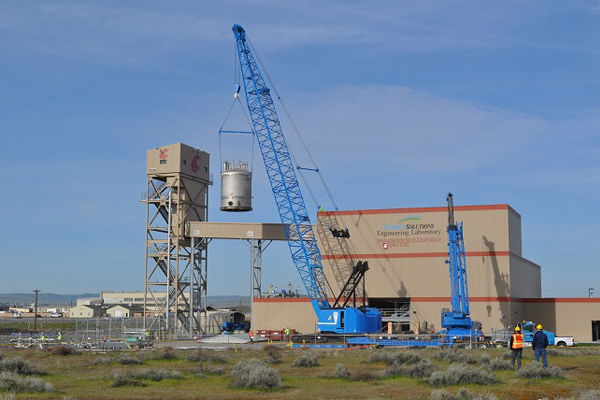 In Richland, the vessel will be installed in a facility specifically designed for full-scale testing of the vessels to be used to properly mix radioactive liquid wastes at the Vit Plant. The testing will use nonradioactive materials. Greenberry was among 35 companies honored for work supporting Bechtel’s Nuclear, Security and Environmental global business operating unit during 2015. Bechtel awarded the test vessel fabrication subcontract to Greenberry in mid-2015. The Vit Plant, one of Bechtel’s largest projects, purchased more than $161 million in goods and services from 443 suppliers and subcontractors in 2015, much of it in Washington and Oregon. A Bechtel news release about the award to Greenberry and more than 30 others is available on the Bechtel website. A 30-ton stainless steel vessel is lifted out of the Full-Scale Vessel Test Facility. “Out with the old and in with the new” is appropriate for removal of a 30-ton stainless steel vessel from the Full-Scale Vessel Test Facility, making way for a new vessel that will fulfill a critical role in verifying design and performance of the Pretreatment (PT) Facility at the Hanford Vit Plant. The old vessel, standing 18 feet tall with a 13-foot diameter, allowed Vit Plant employees to demonstrate that pulse jet mixers (PJMs) planned for use in pretreatment would work as anticipated with a range of radioactive waste mixes. Testing of this vessel was completed last December. “Our recently completed tests demonstrated we can consistently and reliably control these mixers,” said Felice Presti, area project manager for the PT Facility. The new vessel will be a full-size prototype. At 35 feet high with a 16-foot diameter, it will function as a final prototype for those to be installed in the PT facility. Its delivery is scheduled for this month. Testing with the smaller test vessel began in 2014. The first set of tests captured data on how the computer controls outside the vessel worked to operate mixers inside the vessel under a variety of tank levels using simulated waste with low amount of solids. A second set of tests, completed in late 2015, studied how the mixers performed under a variety of slurry and tank level conditions, from low to high amounts of solids, using simulants. Vit Plant employees have begun developing a test plan for the full-scale vessel to support requirements verification. Test platform commissioning is expected to begin in late 2016. For more information, visit http://bit.ly/23W9t9z. 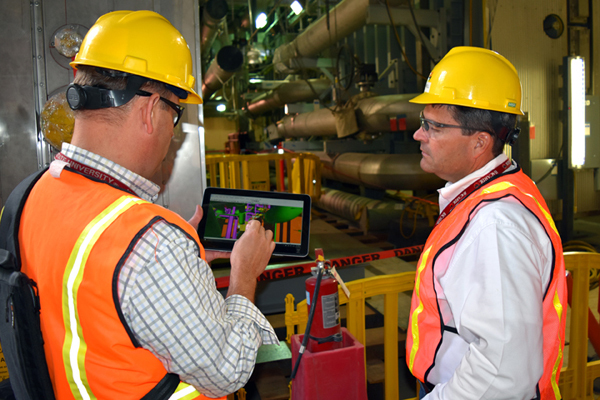 Bechtel employees use a hybrid tablet to review an electronic model in the Low-Activity Waste Vitrification Facility. Jared Thomas has been hard to find at his desk lately. And that’s a good thing. As a Bechtel National, Inc. field engineer at the Hanford Vit Plant, Jared spends more time working in the facilities under construction thanks to recent deployment of hybrid tablets. The tablets allow hundreds of Vit Plant engineers, like Jared, to perform their work from any safe, Wi-Fi-enabled location at the 65-acre construction site. The flexibility is saving time, increasing efficiency and improving quality at the massive construction project. Vit Plant management has been searching to equip employees with a single remote-computing device that is powerful enough to fully integrate critical project software and secure enough to operate within stringent Department of Energy (DOE) and Bechtel security protocols. With hybrid tablet in hand, Jared submits and signs inspection records, generates field changes and documents corrective actions on the spot. He saves printing costs by pulling up the latest documents, drawings and 3D models electronically. Instant access to the Vit Plant network ensures quality by allowing him to always pull up the most current revisions. He also is connected instantly via webcam and instant messaging. By firing up the front- or rear-facing camera, Jared can have real-time discussions about issue resolution with project employees in Richland, Washington; Reston, Virginia; or San Francisco. The portable device can function as a laptop through use of a detachable keyboard or as a standalone tablet with full touch interface. It also can perform as a desktop workstation through wireless docking that connects a keyboard and dual monitor setup. The technology also has prompted field engineers to further innovate. Emergent capabilities involving electronic forms, automated reporting and use of 360-degree video are enhancing quality and task efficiency. For more information, visit http://bit.ly/25YbV5P. Ian’s radioactive waste processing facility experience spans design through operations, including successfully preparing for and meeting the requirements of operational readiness reviews. Before Hanford, he was the chief engineer at a U.S. transuranic waste facility, which he saw from design to an operating facility that was exceeding its expected throughput. Ian is now the technical director and design authority at the Vit Plant. "As an engineer, it doesn’t get any better than this. I love the challenge. And I know I have the right experience to take Hanford’s Vit Plant through the next phase and into operations." Ian understands that when the Vit Plant is operational, the risk posed by Hanford’s radioactive waste is reduced significantly. “I’m confident we will build a plant that will fulfill its mission and safely vitrify Hanford’s waste,” Ian says. 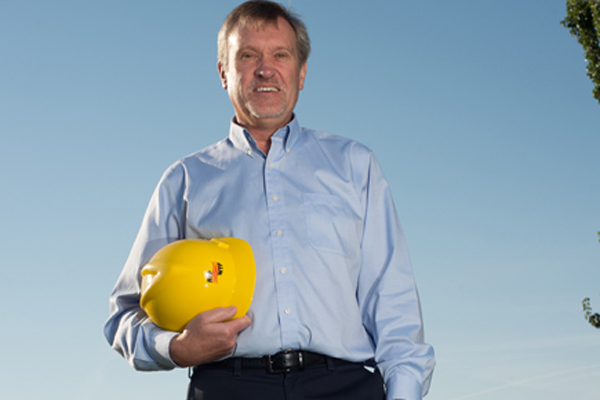 Read more about how Ian leverages lessons from more than 30 years of experience in the nuclear industry to ready the ‪Vit Plant for operations at http://bit.ly/1xV9OfW. Vit Plant employees raised nearly $28,000 and donated more than 350 pounds of food for local food banks during the 2016 Feeding Families Food Drive. All donations support Second Harvest, a local charitable organization that provides food to families in need of assistance. 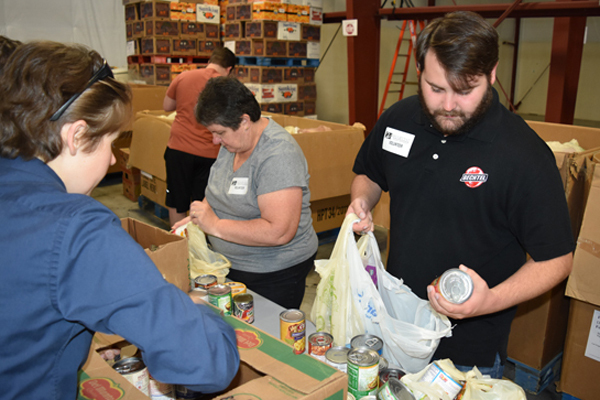 During the drive, nearly 50 Vit Plant employees also helped sort more than 12,000 pounds of food at the Second Harvest distribution center, which equates to nearly 10,300 meals for needy families in the local community. Employees at the Vit Plant donated nearly $13,000 during the 2016 March of Dimes March for Babies fundraiser. The Vit Plant was in the Top 5 for local teams. 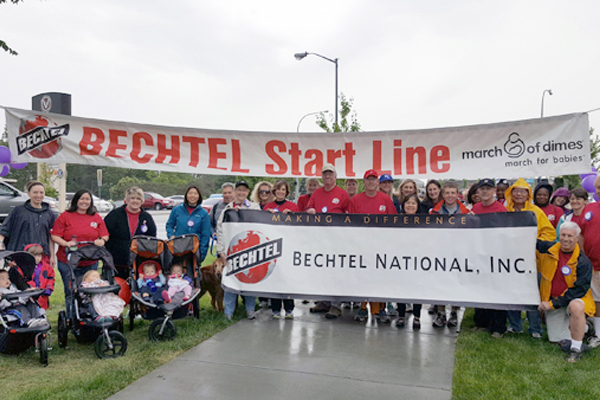 The fundraiser concluded May 14 when more than 30 Vit Plant employees and family members gathered at John Dam Plaza in Richland, Wash., to walk for healthy babies in the March for Babies. 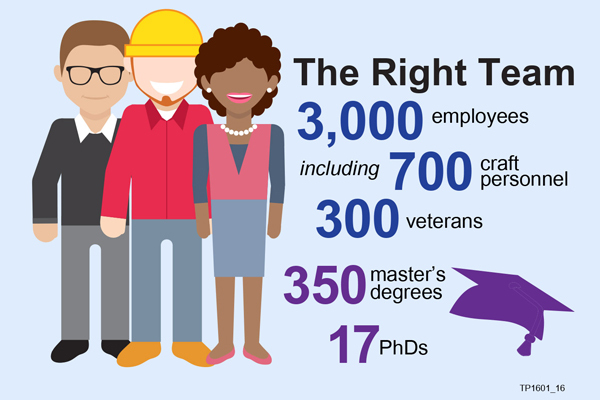 The employees at the Hanford‬ Vit Plant are the right team for the job. Many are recognized experts in their fields and bring decades of experience. They are committed to the safe design, construction, and operation of the vital waste treatment facility because the Tri-Cities is their home. They are protecting their families, the environment, and the Columbia River. Hanford Vit Plant facility walls are made of concrete reinforced by rebar and are up to six feet thick in places. 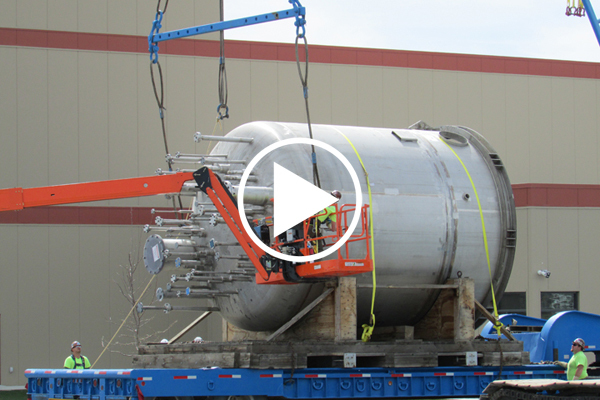 Watch time-lapse video as Vit Plant employees successfully lift a 30-ton stainless steel vessel through the roof of the test facility. The accomplishment is a critical step in verifying the design and performance of vessels in the Pretreatment Facility. Copyright © July 2016 Bechtel National, Inc., All rights reserved.